This really shows that it doesn’t take much money to build cool things. 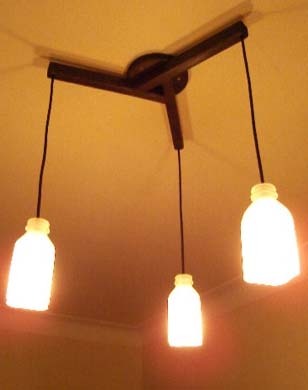 This lampÂ is made from old-style glass milk bottles.Â All you have to do isÂ cut off the bottoms with a wet saw and sand-blast them frosty. The wiringÂ can be made usingÂ old computer power cables.